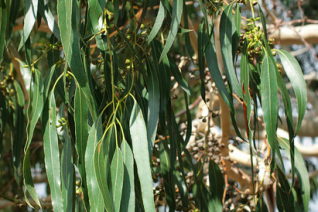 Mountain white gum or just Mountain gum is a wonderful cold hardy Eucalypt that can achieve the largest proportions of any that we grow. In Portland specimens of 60′ occur and it presents as a large spreading tree with sickle shaped leaves of deep green and glossy. Very aromatic when crushed and excellent material for wreaths. In time it develops fantastic powder white bark. Fast growing in youth to 6′ a year in rich soil with regular irrigation. Once established it is very drought tolerant. In time it forms a large spreading crown on a majestic and easy to grow tree. Requires a large site. 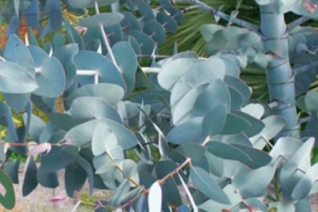 Eucalyptus are intolerant of all shade and should be hit from all sides by sunlight. Otherwise they will grow sparsely and lean towards the sun. White flowers occur in late winter and are more curious than showy. Does have some leaf drop- take note near patios. Cold hardy to 5ºF when established. Gains cold hardiness with age. Moderately deer resistant. 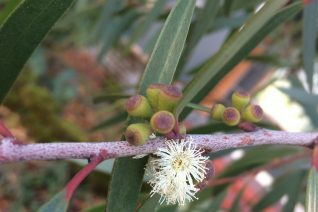 Alpine Cider Gum from high elevations in Tasmania has proven to be one of the reliable species of Eucalyptus for our region. Juvenile (young) growth is perfoliate and very very light gray blue- this is the foliage used as popular cut material. The tree may be cut back nearly to the ground regularly to retain this foliage- The tree must be established at least a year before you do this. Otherwise the adult foliage is totally different. Bright green and elongated leaves with a round tip hang densely on an upright growing nice looking tree. Eventually, the bark becomes amazing with pink and gray striations. Blooms in early spring with white flowers. Extremely fast growing tree to 35′ tall + that is a great evergreen garden tree. Good looking year round. Handles ice and snow like a champ- shedding snow and bending under ice without breaking. Full sun and rich to average soil with regular summer water through the first year. High deer resistance. Hardier to cold with age. 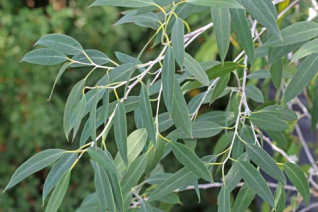 Little Leaf Gum is a handsome, graceful, cold hardy, obscure beautiful Eucalypt for our gardens. Extremely endangered in the wild it survives in just a few locations at high elevations – always above 3500′, in the SE Australian Alps. That alone gives us reason to grow this fantastic little tree. Fast growing small tree of very fine texture. To 22′ tall and half as wide in our climate. Single or multi-trunked the bark becomes glossy and shedding with time. Remarkably fast growing in youth, easily 3′-6′ in a single season- achieving tree status in just a few years. Wonderful fine textured evergreen that casts the lightest shade. Small groups of white flowers bedeck the stems in late summer and autumn- and sporadically through the year when older. Full sun and an open exposure. Very, very hardy to cold when established. There are two of this species planted along I-5 near the Woodburn Factory Outlets that have been there more than 35 years. They have endured temperatures near 0ºF at least twice in that locale with little to no injury. Takes summer drought but prefers a few good soaks when its really dry. Good garden tree. Dislikes shade. Open exposed location. The tree pictured is at the the Oregon Garden in Silverton. Excellent small garden tree. Spinning wheel gum is one of the prettiest of the cold hardier Eucalyptus. Named for its striking blue/gray perfoliate round foliage as a juvenile. In time as the foliage morphs to adulthood each new leaf becomes longer and more pendulous. A small tree in our climate to 18′ tall with a widely spreading crown. Fast growing tree, especially in youth. It may be damaged in our coldest winters- losing branches or even freezing to the ground if temperatures drop below about 8ºF. Re-growth which will be juvenile is rapid in spring and it can recover its full height in just two or three seasons. Damage occurs about once every 7 years- and slightly more often in rural settings. Best in the warmest possible part of the garden- and not for cold gardens or subfreezing wind prone sites. Excellent, highly aromatic cut foliage. White flowers line the stems like small sea anemones in winter. In time it develops a strongly weeping habit. 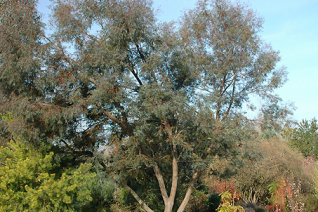 Excellent little multi-trunked hardy Eucalyptus that we love for its height, graceful foliage, and handsome bark. To just 15′ tall after many years it grows quickly when young. The 3″ long medium green glossy leaves are thin and slightly curved. In winter the interior twigs are lined with wispy white flowers in clusters of six. Seldom sets seed in our climate. Excellently adapted and scaled for urban gardens. Very graceful and pretty year round. The leaves are held by vivid red petioles and cut material from this tree is excellent- if somewhat limited from size and slower re-growth. 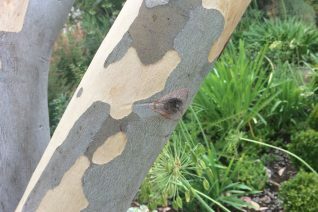 This small tree forms multiple trunks- no single trunk ever happens, and the bark is a soft glossy taupe. Very pretty tree. Related to and included in the category Snow Gum. Hardy without damage to just below 10ºF- and likely much lower. Snow gum is a wonderful cold hardy tree for the Pacific Northwest. Scimitar shaped gray foliage is pendant and handsome year round. This rapidly growing tree thrives in full sun and virtually any soil save for boggy conditions. In just a few years it develops amazing python mottled bark in tones of gray/tan/olive green. The bark sheds in mid-summer and can be a bit messy. Site accordingly. Grows 4′-5′ a year when young. Irrigation just increases this growth rate. Stake only when VERY young then let it form a sturdy trunk on its own. The vast majority of this Snow gum will form multiple trunks. Its possible to select one sturdy main trunk when young- pay close attention as they grow very fast. To 30′ tall and half as wide in 10 years. Snow gums have a weird habit of growing horizontally before reaching upwards. This is natural. Handles ice and snow no problem. Cold hardy to brief dips to 0ºF. Mountains of Australia. White fluffy flowers in clusters in winter. Avoid all shade. Jounama Snow Gum is repeatedly one of the cold hardiest Eucalypts and it is excellently adapted to our climate. Gray/blue scimitar shaped leaves are pendant on a spreading umbrella shaped frame of a tree. Often the trunk forks just after emerging from the ground into multiple handsome stems. This increases the surface area where you can enjoy the ravishing exfoliating bark. Bark drops in late summer to reveal python like patches of taupe/grey/green and is showy through winter. In autumn the upper branches are decorated with small fluffy white flowers. One of the few Eucalyptus that will endure subfreezing wind- in fact this tree has been hardy to brief dips to 0ºF (-18ºC). Explosively fast growing when young to 35′ tall in just 7 years. Give it room. Light summer water in virtually any well drained soil- including clay. Do not stake. Let it produce its own sturdy leader. Sheds ice and snow like a champion. 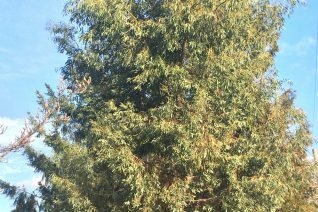 Though this is a subspecies of Eucalyptus pauciflora- a snow gum just like E. p. ‘Niphophila’ there are several differences from that tree. The leaves on E. p. debeuzevillei tend to be wider and more substantial than ‘Niphophila’. Also, that gum nearly always forms several trunks. This is less common with Jounama Snow Gum and in my experience it is a slightly taller tree. It can also vary in its habit from being very wide and spreading to skinny and fastigiate- its simply the luck of the draw and you cannot decipher this future habit as a seedling. Avoid heavy watering in hot conditions and site in a well drained place. Its completely drought tolerant and should be treated that way. Winter water when its cool is irrelevant. Overall it is a fast, healthy, and easy to grow tree in just a short amount of time.